Among the distinctive activities that make Okemo such a marvelous family mountain destination are new kids snowmobile tours on specially designed ‘kidsbiles’. 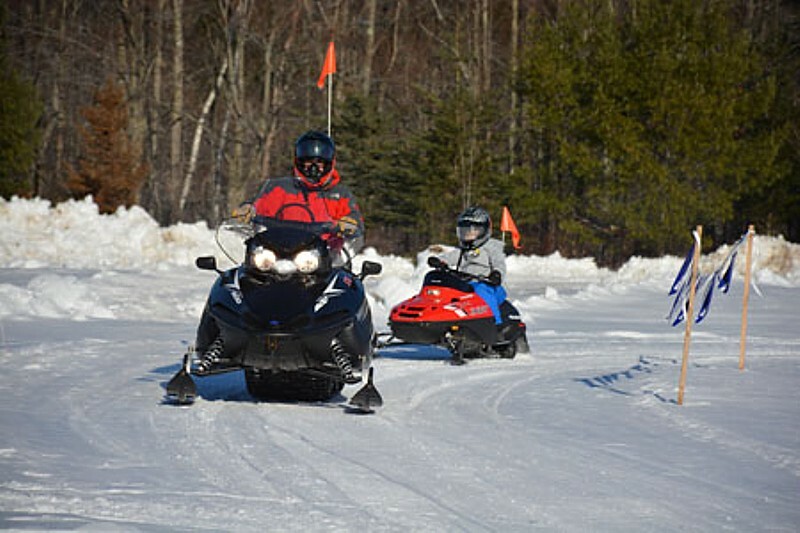 LUDLOW, Vt. – Okemo Mountain Resort has added kids’ snowmobile tours to its lineup of winter activities for families visiting the popular ski and snowboard resort. Pintsized Polaris snowmobiles travel at a maximum speed of 8 mph. Kids love the look and sound of the Indy 120 XC – a real snowmobile built for kids. Each 15-minute tour consisting of up to four riders takes place on a specially designed course at the Jackson Gore Paleo Field and is led by an adult riding a full-sized sled. Riders must be between the ages of 5 and 12, weigh no more than 120 pounds and be no taller than 5’4”. Helmets are required and provided for riders. Each tour is $29 and reservations are recommended. Renowned for its commitment to snowmaking, world-class grooming, and a vast selection of trails that span five distinct mountain areas, Okemo Mountain Resort excels at providing a memorable winter vacation experience off the slopes, as well as on. Visitors can enjoy mountain coaster rides, ice skating, snow tubing, snowshoeing, cross-country skiing, swimming, year-round indoor golf, racquetball, fitness classes, aerobic and weight training, massage, sauna, relaxing by a fire, or soaking in a hot tub. The Timber Ripper Mountain Coaster is a four-season attraction that offers a scenic and exhilarating ride through alpine forests and along the contours of the mountain at Okemo’s Jackson Gore. The roller-coaster ride features tubular rails for a smooth run down the mountain at any time of the year. Sled-like cars carry two passengers in comfort but can be handled easily by one alone. The riders are in control of their speed and this gives them a unique hands-on experience, encouraging repeat visits. Visitors, age 7 and older, load and unload The Timber Ripper in the Jackson Gore base area, near the bottom of the Coleman Brook Express lift. The ride starts with a five-minute, 1,600-foot climb followed by a 375 vertical-foot descent along 3,100 feet of track with turns, waves, camel backs and banking loops at speeds of up to 25 mph. The Ice House, a multi-functional, year-round sports pavilion, features a covered skating rink that is maintained by an ice resurfacing machine. Skate rentals are available and skaters can enjoy a hot chocolate by the fireplace inside the attached building. When winter wanes, The Ice House transitions to a warm-weather sports center with tennis courts, a basketball court and covered, single-lane jogging track. Snow tubing is a popular early-evening activity at Jackson Gore on weekends and during holiday periods and other designated times. Specially groomed chutes keep inflatable snow-sliding “inner tubes” on track for a thrilling slide down a snowy slope. Snow tubers must be at least 42 inches tall. Specialized snow tubes are available for rent by the hour and a magic-carpet style surface lift returns tubers to the top of the chutes after each thrilling ride down. Located halfway between Okemo’s Jackson Gore base area and original Clock Tower base area, the Okemo Valley Nordic Center welcomes winter enthusiasts with 22 km of tracked and skate-groomed cross-country skiing trails, and 13 km of trails designated for the use of snowshoers. Okemo’s Nordic Center trails are ideally suited to all ability levels, and they are groomed daily using state-of-the-art grooming machines. Inside the clubhouse, visitors enjoy a fully stocked Nordic Shop with the latest advances in outdoor clothing and accessories. Demos, equipment rentals, repairs and waxing are available on-site. Dressing rooms with showers and lockers make a nice change from the typical rustic facilities of most Nordic centers. Golfers can stay on top of their game with Okemo’s Indoor Golf Training Center at the Okemo Valley Nordic Center. The 6,000 square-foot, indoor practice facility houses a 700 square-foot putting green, swing stations and a computerized virtual golf simulator. Golf instructional programs are available with group and private lessons offered. The Indoor Training Center is an ideal way for golfers to improve upon their skills and maintain their swing during the winter months. Golf enthusiasts can purchase a golf winter season pass to the indoor golf facility or visit one day at a time for a daily fee. Okemo’s Spring House is a center for relaxation and rejuvenation. The two-level, 18,000 square-foot fitness and aquatic center features a recreational swimming pool with lap lanes for designated swim times, a five-person hot tub, and a children’s pool with a whimsical frog slide and numerous splash and fountain features. In addition to all that aquatic action, The Spring House offers a racquetball court, a fitness-class studio, weights and cardio equipment, a sauna, and locker rooms that include a unique family locker room area. For the ultimate indulgence, massage services are available just steps away, inside the Jackson Gore Inn. For resort visitors who opt to travel farther afield, the village of Ludlow and the entire Okemo Valley serves as a gateway to Okemo Mountain Resort, offering shopping, dining and a variety of community events that are open to the public. For more information about Okemo Mountain Resort, call (800) 228-1600 or visit okemo.com.